Does your horse take a step back after completing a halt? If he does, you’re not alone. This is a really common issue. Understanding why the horse is taking the backward step is the first step toward solving the problem. I recently received a question about this in the comments section of my 5 Reasons Your Horse Won’t Stand post from last year. Since many of you have this question, I figured I’d put the answer into the form of a new post. Thanks for your note, and your question. With this in mind, I’ve posted an article called The Halt in the articles section. Of course, that article deals with just about everything there is to talk about with the halt. 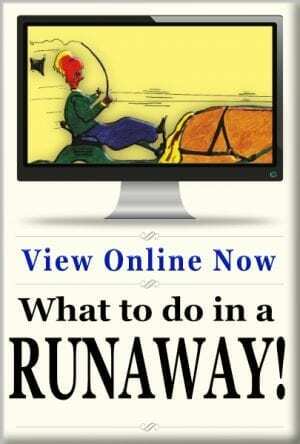 Your question is specific to that annoying step back that many horses and ponies take after completing a halt. The first thing that I’d suggest is going back to basics in training the halt with your pony. Work on your walk to halt transitions first. If you haven’t sufficiently trained the walk to halt transitions, that may be the source of the problem. 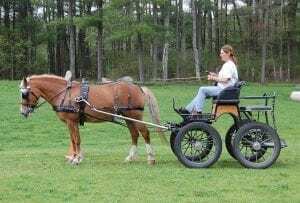 Those instructions are there because it is necessary to first teach the horse to halt from the walk, before attempting to perform a halt from the trot without any walking steps. Many people make the mistake of trying to get the horse to trot directly into the halt without taking any walking steps. This makes it very difficult for the horse to maintain balance going into the halt. The step backward is often a sign of the pony rebalancing herself after the halt. Another reason your pony may be stepping back after the halt might be that you are not giving enough of a release in contact at the end of your halt. 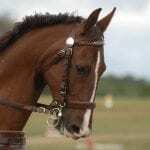 It feels counterintuitive to give with the reins, even though you are asking your horse to stop. But in the last moment of a halt, your pony needs you to allow the head and neck forward slightly so she can rebalance herself. It’s not uncommon to have a horse take a step or two backward after completing a halt. The two main reasons this happens is the horse is unbalanced in the halt, or the driver is continuing to ask for the halt after the horse has committed to the halt. The latter problem is where you should put your attention first. 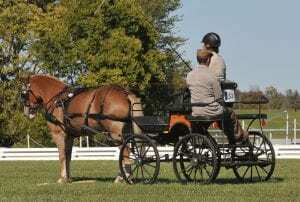 It’s very common for drivers to stop and hold the reins tight as the horse completes the halt. This is left-over programing from driving your car. After all, when you get your car to a stop sign, you continue to hold the brake pedal until you’re ready to move forward again. Unfortunately, that thinking ignore’s the horse’s balance in the halt. Through a well-executed halt transition, the horse must shift his balance to his hindquarters. 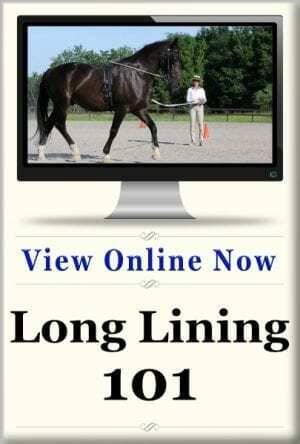 If the horse is compelled to keep his balance rearward after he’s halted, he has no choice but to take a step back to remain under his center of gravity. To combat this, the horse’s head and neck must move forward slightly to counterbalance the rearward shift in balanced. 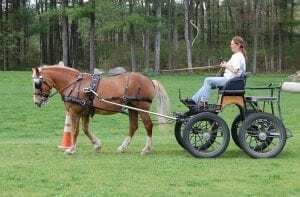 If the driver’s hand is unyielding as the horse enter the halt, he won’t have the opportunity to use his head and neck to rebalance, and thus will take a step back. 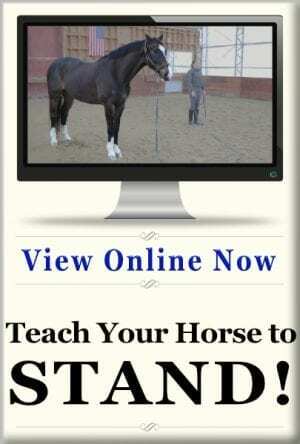 The solution is quite simple: The driver must release some of the contact as the horse steps into the halt. Of course, the execution of that solution may be a little more tricky than it sounds. It feels counterintuitive to release the contact at the very moment that you want your horse to halt. 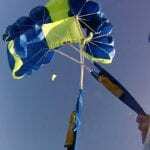 The best time to practice this skill is through walk to halt transitions. The amount of the release required largely depends on the horse’s level of training and collection (see “Halt Through the Levels” below.) Horses with more elemental skills will require a greater release of contact, while horses with higher collection may only need a subtle give in the reins. 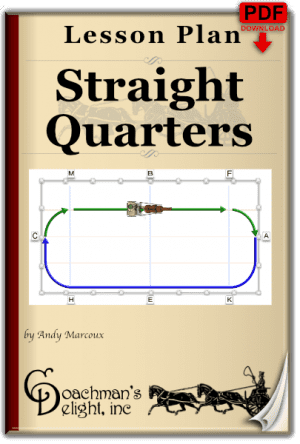 The horse may need an additional forward aid to understand that he needs to once again move his balance toward the bit as he completes the halt. 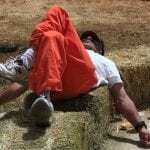 This often can be accomplished with a simple cluck or a very light whip aid as he takes the final step into the halt. 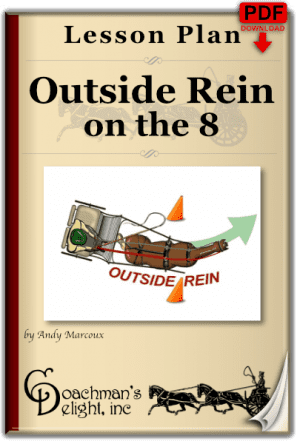 The balancing act is the timing and degree of the release such that it still communicates that you want the horse to halt, but you want his energy to continue to remain in the bridle. Be patient with this project! 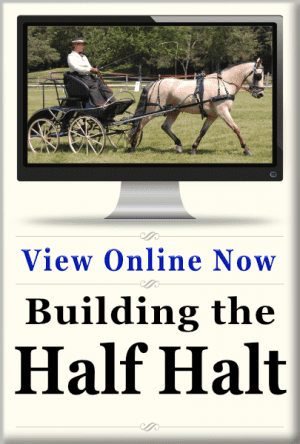 When you master this skill, your horse will halt on the bit, ready for your next request. Hopefully, that gives you some good things to start working with. I’d suggest devoting a few training sessions primarily to this project. It’s easy to forget to work on these types skills on their own since there are so many other things that you want to do with your driving. But if you want to improve on one specific skill, you have to give that skill your full and undived attention. Good luck with your pony, and by all means, let me know how it goes!